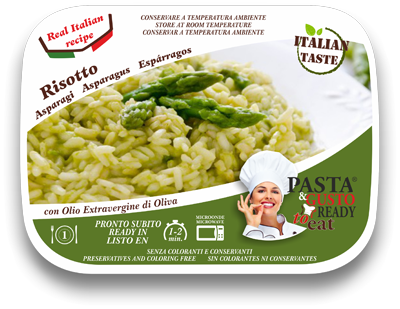 water, rice , asparagus 21%, food grade gelatine (animal jelly, salt, sucrose), butter (MILK), sunflower oil, powder cheese (MILK), broth (CELERY), garlic powder, salt, spices, aromas. MICROWAVE – Place the bowl in the microwave without removing the protective foil and heat for 90 seconds at 750/900 Watts (medium-high). PAN – Pour the content into a pan, add two tablespoons of water and heat for 2/3 minutes with medium flame stirring with care. Copyright © 2018 Pasta & Gusto Ready to Eat.